So now we come to a touching tale of a children’s TV clown called Fuzzy. Will love save him from a Krusty future at the bottom of a whisky bottle? Yes, it’s Eels, an ever-present in my lists over the last decade or more, with Feeling Kinda Fuzzy, taken from their fine Spring release, Wonderful Glorious. 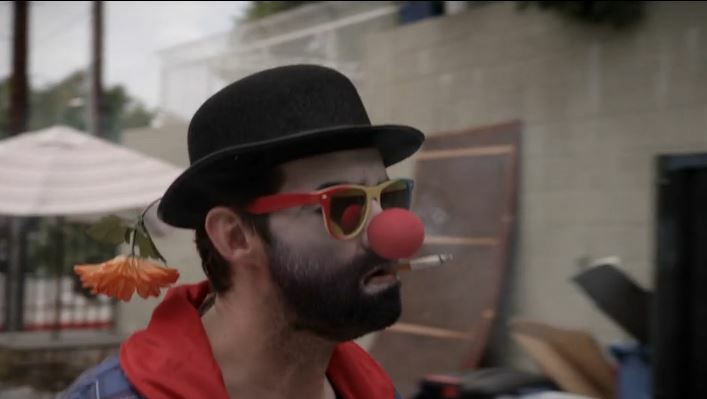 By the way, I saw Eels three times at three different venues on the tour this year but missed the famous incident in which a clown got his own back, also posted below. Meanwhile scroll down for Roy and Andy’s picks, or click here to see the countdown so far. Like Richard, I too have gone “State-side” with my number 14. I’m by no means a massive fan of QotSA, although there’s no question they do produce some fine foot-stomping rock. Josh Homme is the kinda guy that men want to have a beer with, women want to sleep with and the Arctic Monkeys want to be when they grow up. Air guitars at the ready now! Good track from a fine album – really enjoyed seeing them again in Brighton, probably the most singularly entertaining band around at the moment. Love the QOTSA album – a definite return to form – although this is probably my least favourite track ! My number 14 is from another Moshi, Moshi artist. ‘Know Yourself’ by Nothankyou. This definitely has the Moshi Moshi signature i.e. trademark, highly infectious warped pop – a sort of electronic Sugarcubes. I know absolutely nothing about the band other than I nearly didn’t include them because of their terrible moniker. interesting, sounds like early Beloved track – not a particular one just generally.